The Alte Nationalgalerie on Berlin’s Museum Island is filled with art from neoclassical and the romantics to the impressionists – the full spectrum of 19th century paintings and sculptures. The Alte Nationalgalerie (Old National Gallery) in the shape an antique Greek temple is one of the smaller museums on Berlin’s Museum Island. It is home to Berlin’s collection of mostly 19th century European paintings and sculptures covering the period from the French Revolution to the First World War. The emphasis is on German artists but the collection also includes works from artists from other European countries. 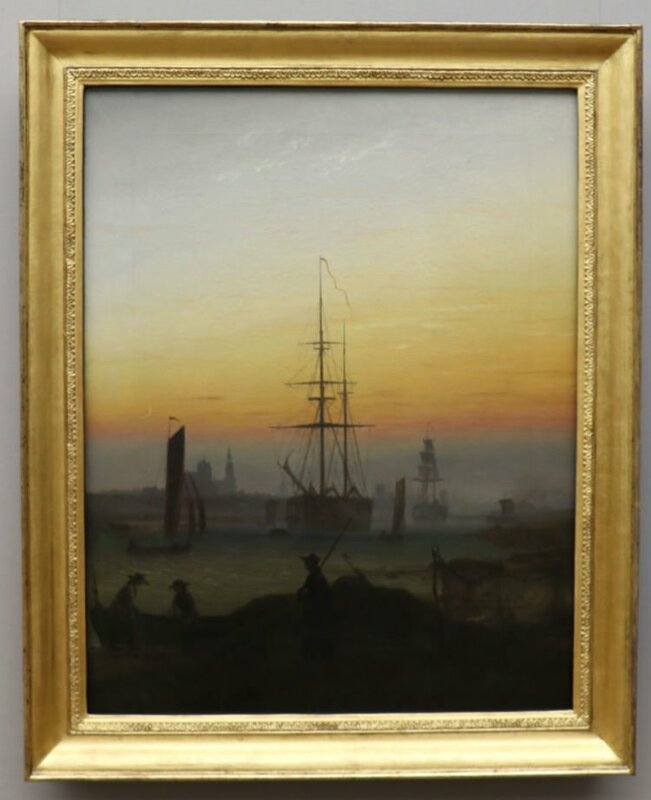 The current permanent exhibition includes major works by German painters Caspar David Friedrich, Karl Friedrich Schinkel, Max Liebermann and Adolph Menzels. 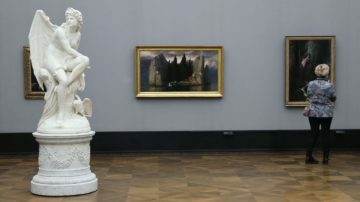 The artworks displayed in the Alte Nationalgalerie range from the origins of neoclassical art (Klassizismus) and romanticism (Romantik) to impressionism (Impressionismus), realism (Realismus) and Secession. Most of the works are by German artists but the museum also has a fine collection of French impressionists and realists from various European nations. The Alte Nationalgalerie opened in 1876 as the third museum on Museumsinsel. It was designed as a neoclassical Greek temple by Friedrich August Stüler and completed by Johann Heinrich Strack – both students of Schinkel. It suffered damage during the Second World War but in contrast to many other buildings on the island already reopened in 1949. 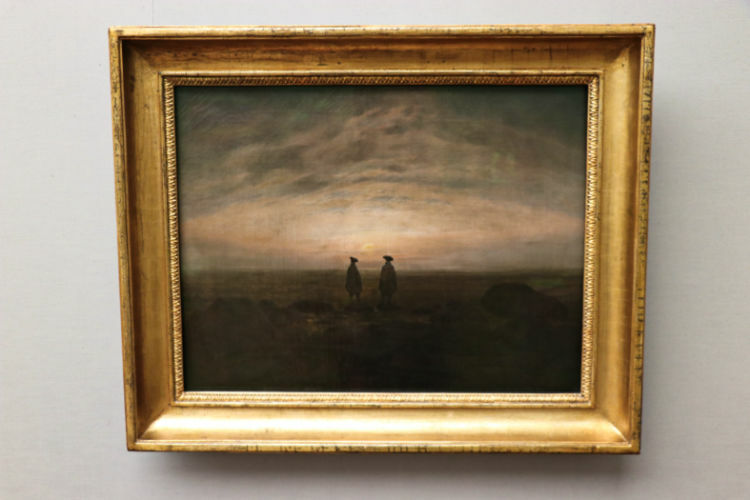 Only around 500 of the 2000 works in the collection are on permanent display, which makes the Alte Nationalgalerie less overwhelming than many of the other huge museums in Berlin. As with other 19th century museums in Berlin, the entire building is a Gesamtkunstwerk with monumental staircases, intriguing architectural details and eye catching decorations. The third floor covers the first half of the 19th century – often referred to as Goethezeit (Age of Goethe) and the Romantik. 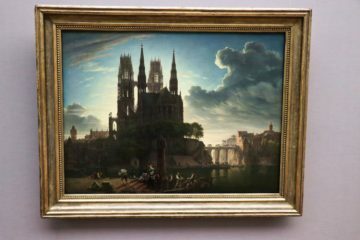 The most-important works here, and probably in the whole museum, are by Caspar David Friedrich but also have a peak at the works by Anton Graff and especially Karl Friedrich Schinkel. A large room is dedicated to the paintings of Karl Friedrich Schinkel. 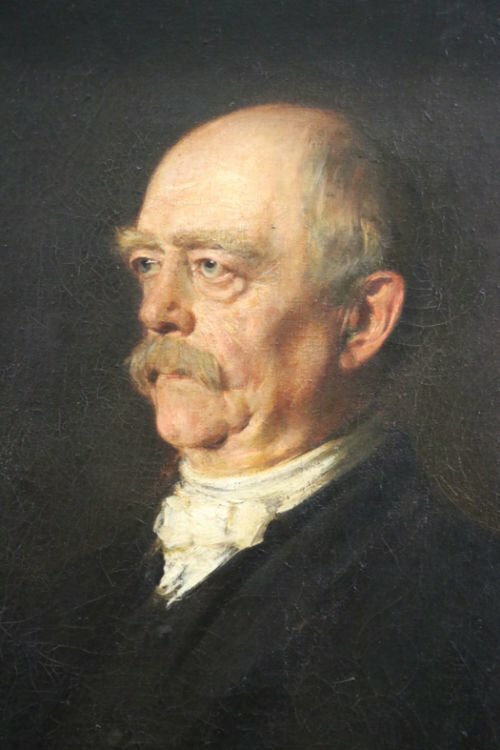 He famously designed some of the most important neoclassical buildings in Berlin including the Neue Wache, Konzerthaus and Altes Museum but in his earlier fantasy paintings high gothic dominated – a style distinctly out of fashion during much of the 19th century before it was re-invented as the most German of styles around the time of German unification in 1871. 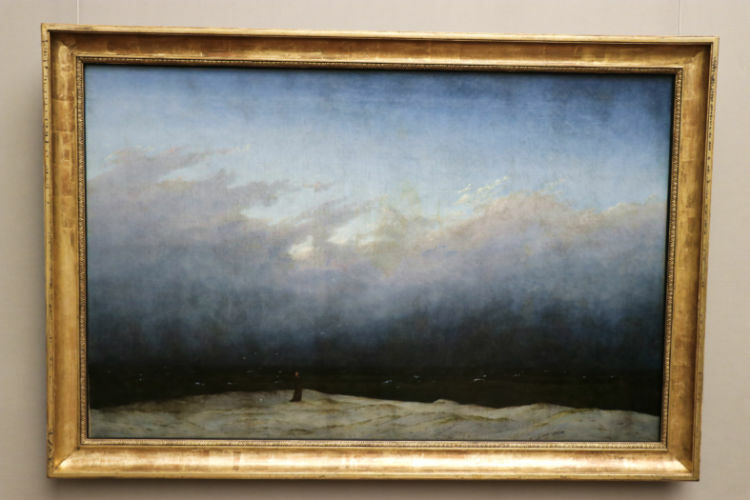 However, Caspar David Friedrich is the clear highlight on the top floor. He is arguably the most celebrated German painter from the romantic era and the Alte Nationalgalerie has some of his finest works. 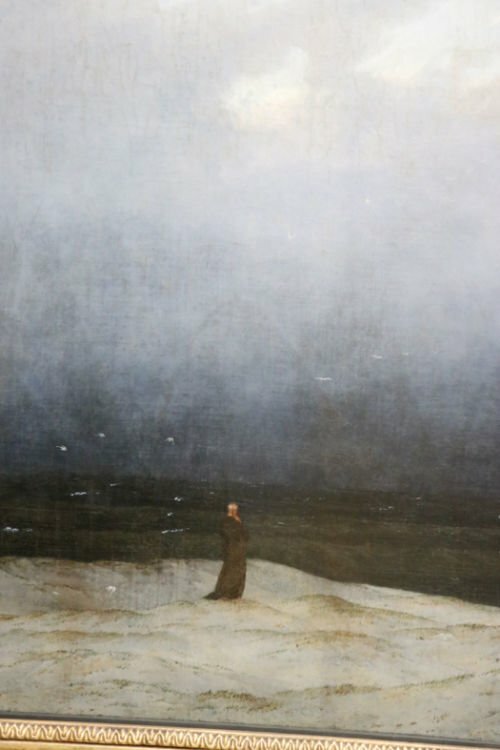 The two most famous hang side-by-side: “Mönch am Meer” (Monk by the Sea) and “Abtei im Eichwald” (Abbey Among Oak Trees). 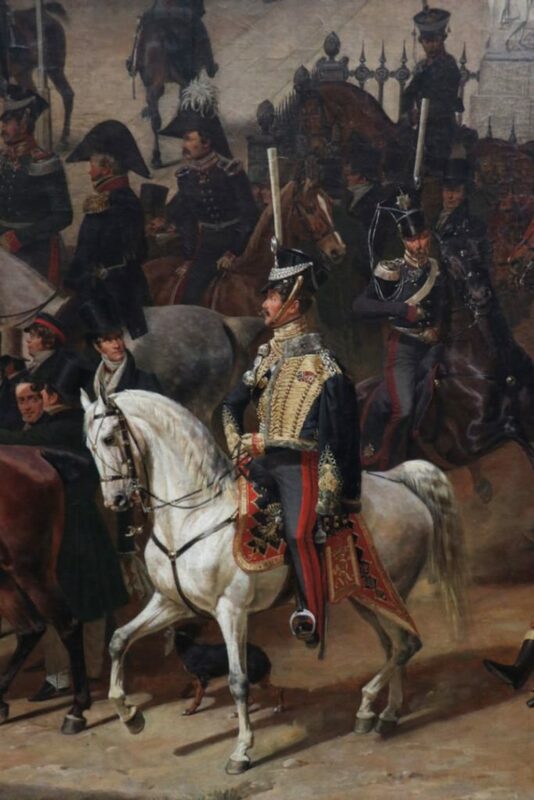 Both were exhibited in 1810 and propelled Friedrich to fame when the king of Prussia bought both. 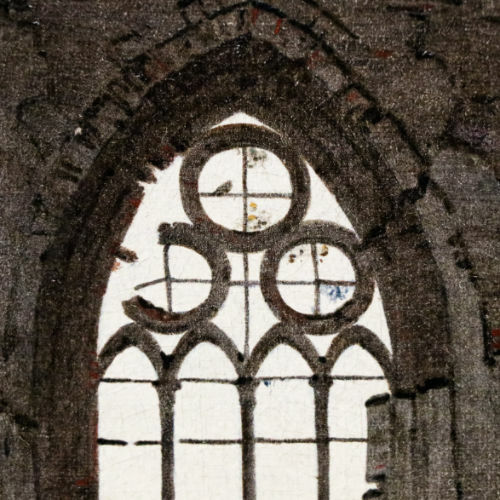 Look closely to see the gulls warning the monk and the birds in the window of the ruined church. 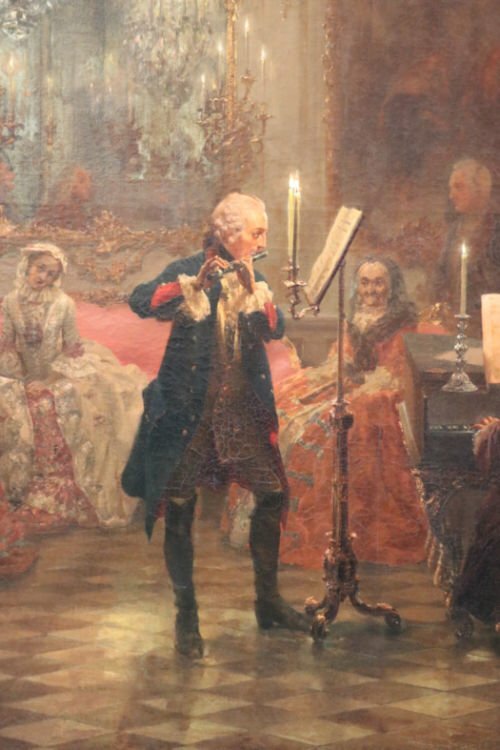 Many of his later paintings in the same room show how his style developed. 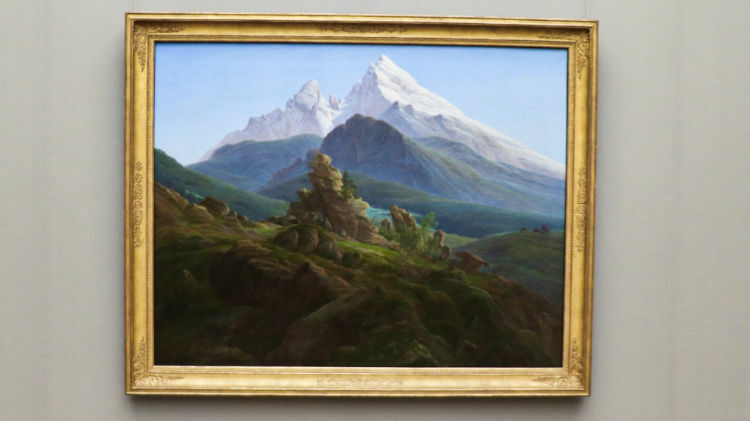 Note “Der Watzmann” of the Alpine peak at Berchtesgaden – Friedrich never traveled south of the Harz and based the painting on works of his pupils. On the second floor of the Alte Nationalgalerie is the ever popular collection of French impressionists. Works on display include paintings by Edouard Manet, Claude Monet, Auguste Renoir, Edgar Degas, Paul Cézanne and a few sculptures by Auguste Rodin. Manet’s “Im Wintergarten” (In the Conservatory) is generally the highest rated of the museum’s French collection. The second main hall is used for Deutschrömer (lit. German Romans, i.e. German artists who worked in Italy). Large works on display here include amongst others a version of Arnold Böcklins “Toteninsel” (Isle of the Dead), Giovanni Segantini’s large “Rückkehr zur Heimat” (Returning Home) and paintings by Hans von Marées and Anselm Feuerbach. The smaller halls have mostly German realist and impressionist paintings and sculptures. 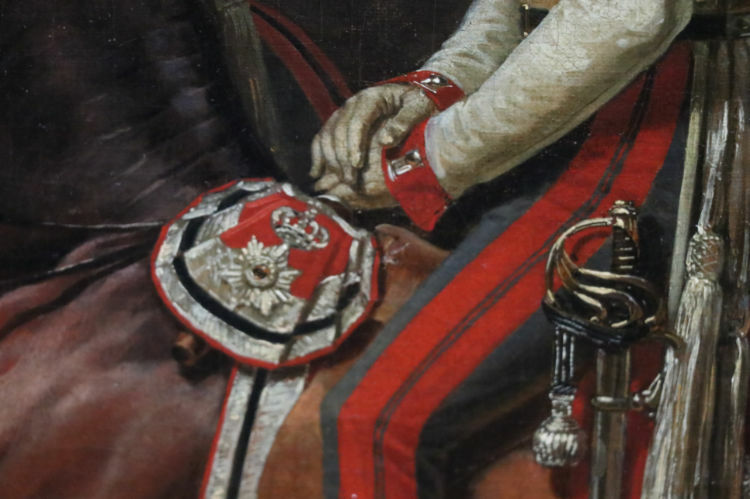 Note the Franz von Lenbach paintings of Otto von Bismarck and Richard Wagner. The Alte Nationalgalerie also has a vast collection of works by Max Liebermann. 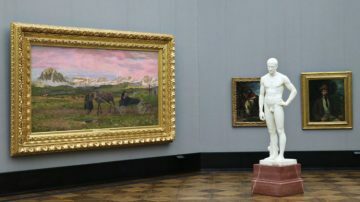 Classical sculptures and further realism paintings are on display on the ground floor of the Alte Nationalgalerie in Berlin. The exhibition includes a small but very high quality collection of classical sculptures by very famous artists. 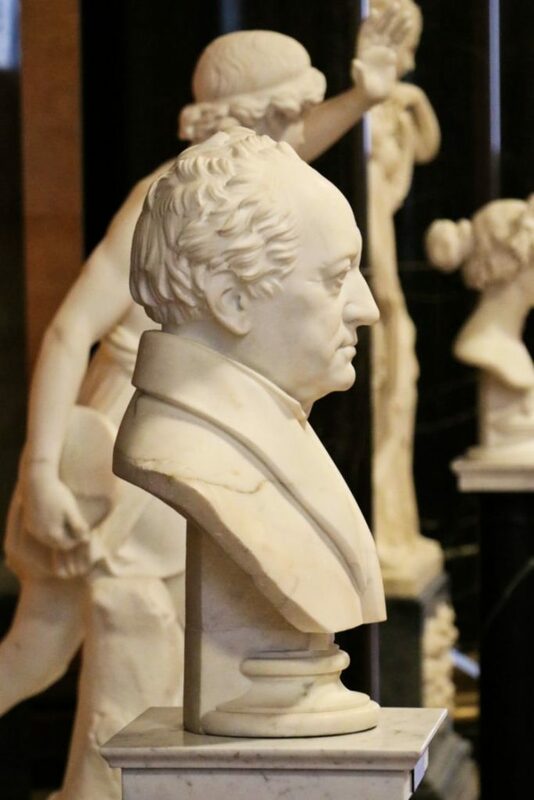 Johann Gottfried Schadow’s grouping of two Prussian princesses are highly rated but his bust of Goethe is instantly recognizable. 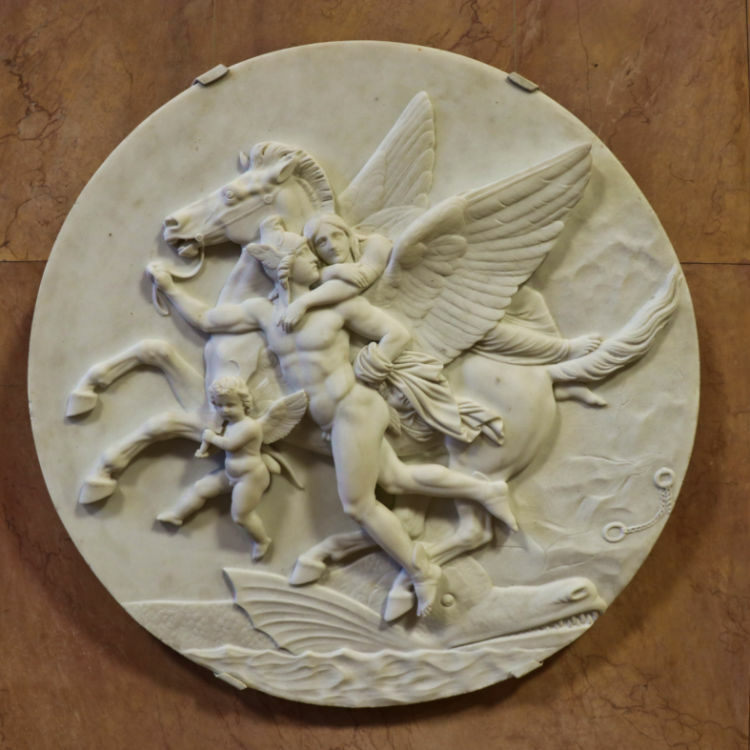 Other sculptures are by Christian Daniel Rauch, Bertel Thorvaldsen, and Antonio Canova. 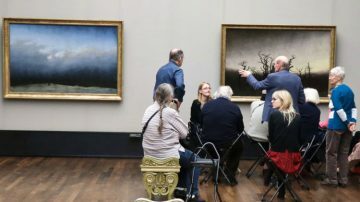 The smaller rooms have works by realist painters including John Constable, Gustave Courbet and various painters from the German-speaking world. It also has a few works from the Gründerzeit and Secession. 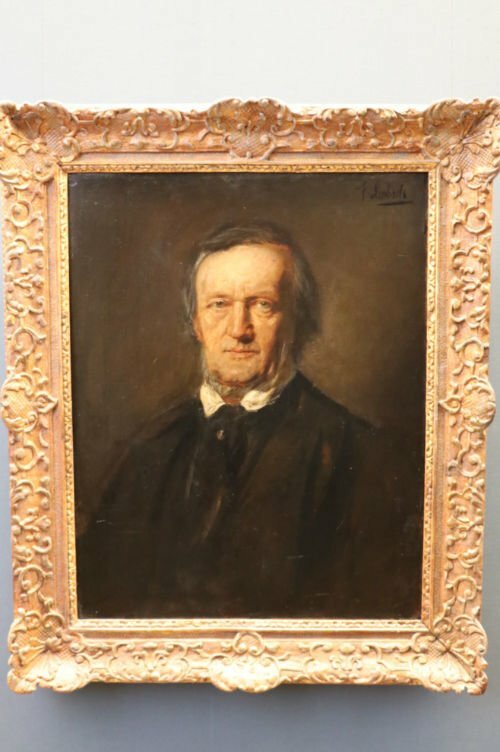 However, the best-known works here are the paintings by Adolph Menzel. 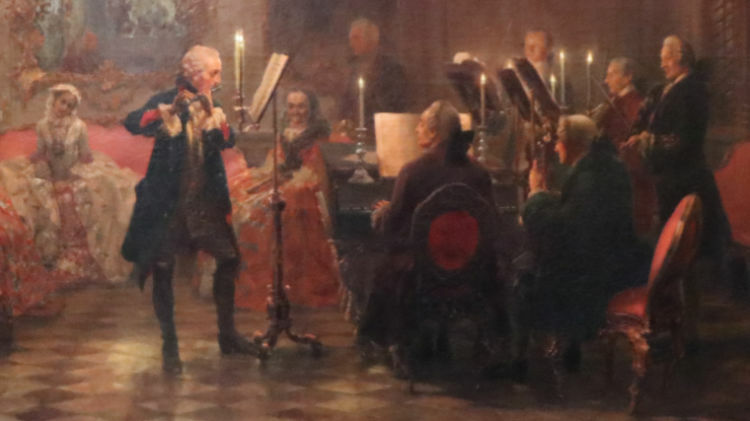 Several cover important moments in Prussian history including a very famous work of Frederick the Great playing the flute in concert at Sanssouci (“Flötenkonzert Friedrichs des Großen in Sanssouci”). His realistic “Eisenwalzwerk (Moderne Cyklopen)” (Iron Rolling Mill / Modern Cyclops) is artistically probably higher rated today. 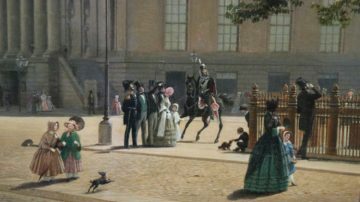 Franz Krüger’s “Parade auf dem Opernplatz in Berlin” was a commission by Czar Nikolai I in the 1820s – it include accurate portraits of several Berlin artists from the period. 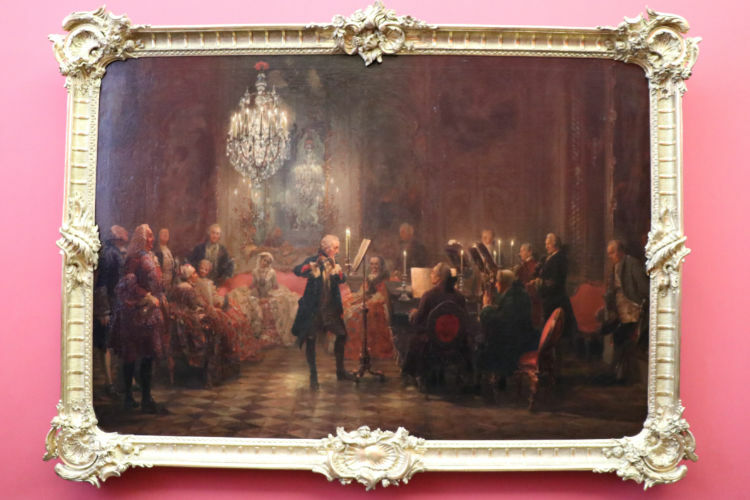 13th to 18th century paintings (Old Masters) are in the Gemäldegalerie (Paintings Gallery). 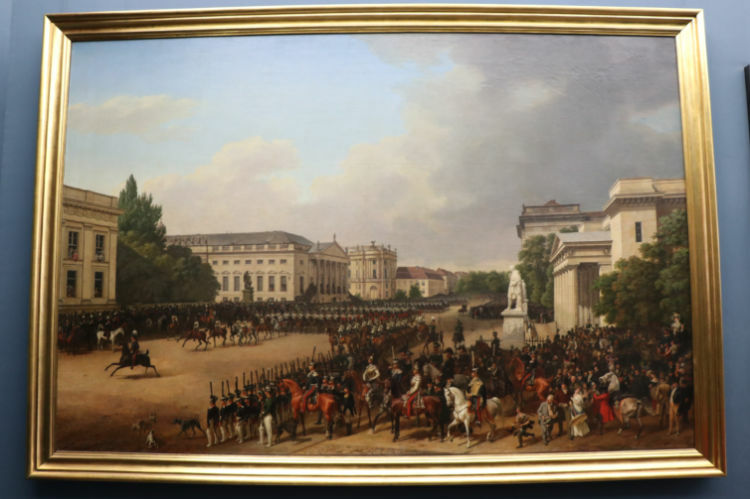 Late 18th century to First World War works are in the Alte Nationalgalerie. Early 20th century to 1960s works are in the Neue Nationalgalerie (currently closed). Contemporary art is displayed in the Hamburger Bahnhof. Medieval to 18th century sculptures are mostly in the Bode Museum. 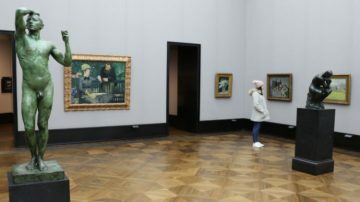 Small but high quality collections of classical modern art including works by Picasso, Klee, and Matisse are in the Museum Berggruen and Surrealist art is in the Sammlung Scharf-Gerstenberg – both near Schloss Charlottenburg. 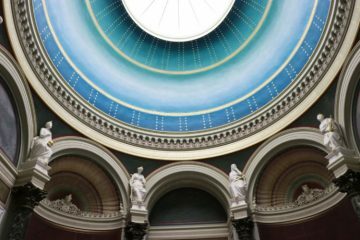 The Alte Nationalgalerie on Berlin’s Museum Island is open Tuesday to Sunday from 10:00 to 18:00, closing at 20:00 on Thursday. As with most museums, the best times to visit is early morning or late afternoon. 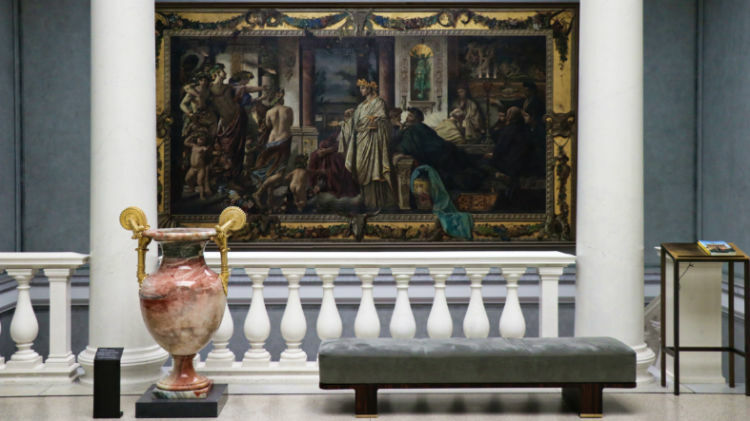 However, the Alte Nationalgalerie is generally far less crowded than the Pergamon or Neues Museum making the gallery a sound choice in the middle of the day too. 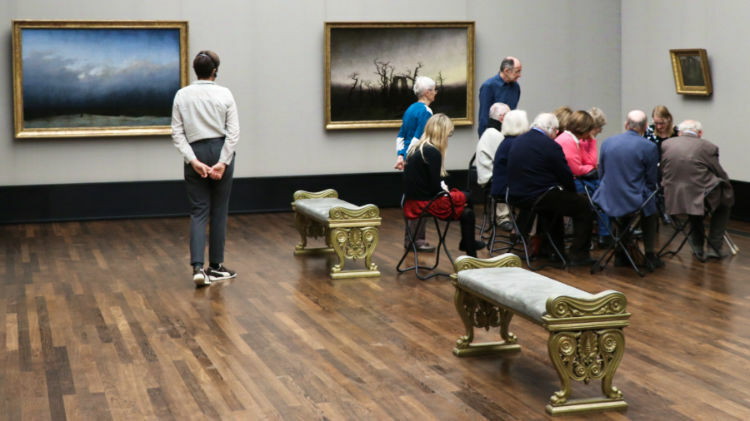 The Alte Nationalgalerie is open on most holidays, including Mondays if a holiday, but closed on December 24 and 31. The coffee corner in the museum shop in the basement is pleasant but miniscule – for more than a drink it is better to head elsewhere. Tickets for the Alte Nationalgalerie is €10 at the ticket counter, online or much simpler from Tiqets or GetYourGuide. Admission is free for children under 18. Many visitors to Berlin will find better value in combination tickets. The most obvious options are the Museum Island Ticket, the Museum Pass Berlin and Welcome Card Berlin but also consider the annual passes for the SMB. With all these options, it is possible to go directly to the museum entrance (but remember to pick up free audio guides first). Temporary exhibitions, such as the Pergamon Panorama, sometimes require a surcharge and definately make free time-slot reservations for the Neues and Pergamon Museums. 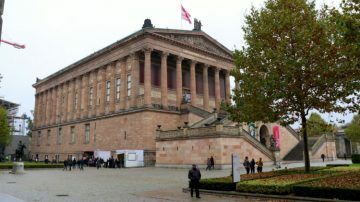 The Museum Island Ticket (buy from Tiqets) is €18 and gives unlimited admission on the same day to the Alte Nationalgalerie, Altes, Bode, Neues and Pergamon Museum. The Museumpass Berlin is €29 (buy from the tourist office or any museum) and gives admission to 30 top Berlin museums on three consecutive days. The Alte Nationalgalerie is included in the Berlin Welcome Card Museum Island and some other city passes. An annual pass (Jahreskarte) for all the Staatlichen Museen Berlin is as cheap as €25 (limited hours). 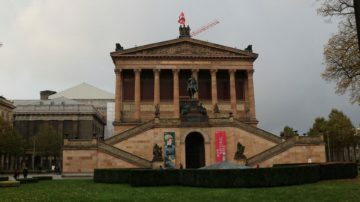 The Alte Nationalgalerie is in an imposing building resembling a Greek temple on Museum Island in the heart of Berlin. The entrance is in Bode Straße – somewhat disappointingly under rather than via the imposing staircase. The most convenient public transportation is bus 100 or 200 that stop at Lustgarden on Museum Island, or bus TXL at Staatsoper. Tram M1 and M12 (Kupfergraben) are also convenient. It is a short walk to Museumsinsel from the endless public transportation options to either Friedrichstraße or Hackescher Markt stations.